An OVA series retelling the entire Hellsing story. Apparently the mangaka was not happy with Gonzo's version and contracted another studio to redo the entire series again. Very different looking (Ex:Victoria's outfit is khaki now instead of blue), but the quality on the demo looks pretty good. German License by OVA Films. Note : This version will not be done by Gonzo who did the original. Also see series prequel: Hellsing: The Dawn. Hellsing Ultimate Hellsing Ultimate is a remake of the Hellsing TV anime from the early 2000s that is meant to be a more faithful adaptation of its manga source material. Focused on the vampire-hunting Hellsing Organization having the powerful vampire Alucard among their ranks, the organization comes at odds with the Catholic fanatic Iscariot Organization and the artificial vampires created by the Nazi organization, Millennium. The immediate thing that sticks out with Hellsing Ultimate is how it relishes in the spectacle of violence it offers up from the three-way feud established between Hellsing, Iscariot, and Millennium. Many of the characters are rather over-the-top in their personalities and motives as they enjoy the gory fighting they take part in or believing they know better than everyone else. Characters such as Alucard, the Major, and Alexander Anderson make for memorable presences in this OVA series due to their bombastic and over-the-top relishing of battle and superiority, as well as the means all three are willing to employ to boast their superiority to others. 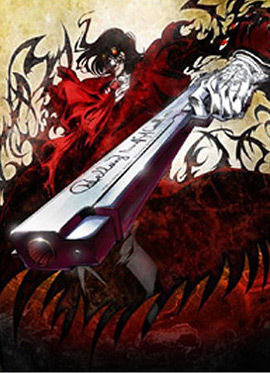 Such spectacle also takes place with the presentation of Hellsing Ultimate as the visuals sport more vivid color and higher detail with scenery and characters compared to the TV anime, and offers some impressive animated sequences during the three-way London war that all three factions duel one another that involve weapons and the supernatural powers of all three factions. The high quality animation does come at a price as Hellsing Ultimate usually cuts corners on animation during the less action-heavy parts of the series to conserve on budget. Outside of visuals, Hellsing Ultimate also comes with a rather impressive soundtrack that mixes orchestral scores and rock music that are surprisingly immersive with the over-the-top action and personalities witnessed throughout the series. Looking past the spectacle and impressive presentation, Hellsing Ultimate carries a fair deal of issues with its plot and characters. Its first episode is sloppily structured, likely to rush the storytelling into developing the main conflict of the series. The series attempts to try making itself deeper than it really is by trying to explore what makes some major characters human or monster, but the storytelling lacks the necessary depth and character focus to explore such ideas since the anime is more fixated on the spectacle of its main conflict. Also, Hellsing Ultimate's moments of humor often clash poorly with the dark and edgy mood it offers, this being quite notable for a number of Seras' scenes where the show's animation devolves into super-deformed animation. If you are a lover of supernatural action anime that are more heavy on style than substance, Hellsing Ultimate is likely to be your cup of tea. Anyone looking for something more deeper to offer in terms of plotting and characters should not waste their time with the series. Last updated Sunday, September 04 2016. Created Saturday, April 19 2014. This is almost a complete redo of Hellsing TV. Everything is sharper, clearer, the graphics are more intense. The one thing WRONG with this OVA? Victoria looks like Ginji Amarou from Get backers. SD mode included, comedy plotlines too. Oh why oh why did they do that? She is drawn so UGLY that I just get appalled that the character I liked the most in the TV series is reduced to comedy relief. Integra is drawn so much better but Victoria so much worse. But in all other respects (including script) this OVA is better. Note : In the R1 Alucard asks Victoria if she is ready to die. In the OVA it's 'Are you a virgin?' because only a virgin can become a Draculina or high level female vampire. Last updated Monday, February 20 2006. Created Monday, February 20 2006.